It was a long wait since my first iPod, but finally the iTunes has landed in Malaysia. Apple made a rather quite launch of the iTunes Store in Malaysia, meaning the days of logging into iTunes with US accounts and gift card purchases are over. Malaysians now have access to an entire treasure trove of songs available for the same prices as they are in the US. That’s about $0.99 – $1.69 per song, or $9.99 per album (roughly). I was so excited, I immediately logged onto iTunes with my Malaysian account to check out the details, it took a while, since I’d forgotten my Malaysian account password, but soon after I was greeted at the iTunes store by Jason Mraz himself. I was also informed that the iTunes Store in Malaysia had more tailored local content these include songs from P. Ramlee, Man Bai, Chinese songs as well as Hindi songs (kuch kuch hota hai for $0.69 anyone?). It’s also good to see that Kau Ilhamku by Man Bai was Top of the Charts, signifying locally driven content. Where else would you see Belaian Jiwa and Moves Like Jagger on the same charts? 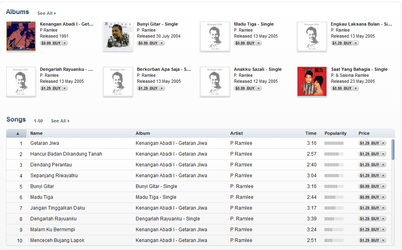 Also there are more P. Ramlee songs on the Malaysian iTunes store than there is on the US iTunes store, so it’s tailored to Malaysian taste. Of course that raises the questions, are there more ‘American’ songs on the US store than Malaysia? Is the Music Selection the Same as the US? In all the excitement I was still a bit skeptical on whether the content offered by the Malaysian store matched the US one. So I did a bit of snooping. Using a handful of artist I considered was representative of everyones taste, I tested the Malaysian store against the US store to see if indeed we had the same songs and albums and if the content available in Malaysia matched the content available in the US. 5. Justin Bieber – For the interest of science I had to include Mr. Bieber, he represents Modern Pop. Now while it’s not the same, I noticed in some cases the Malaysian iTunes store had MORE stuff than the US one, but I attribute this to the HUUUUGE amount of ‘karaoke’ versions of songs available. The Karaoke versions are what some might refer to as ‘minus-one’ versions of the song, with just the music but no vocals. Note to all Malaysians: if you want to sing a song with just music and no vocals–Learn a musical instrument–learning to operate the remote control at Red Box isn’t considered a musical instrument. Finally it’s also good to see local artist being featured prominently on the store. While my download of Getaran Jiwa by P. Ramlee cost me $1.29 most local content on the store cost just $0.69 so that’s really cool. Local artist should be flocking to iTunes as we speak. I’m not really a fan of Chinese or Hindi songs, so it’ll be good to hear if Malaysian find the selections of these songs sufficient to satisfy their musical cravings. As much as we hate the Malaysian censors, it looks like the censors have given iTunes a miss. If you don’t believe me, search for Fashion Nugget by the band Cake on iTunes and then preview the song. A mild warning before you do, the song isn’t labled explicit for no reason. NOT SAFE FOR WORK (NSFW), for that matter not safe at home with the kids either. I’m absolutely ecstatic that Malaysia finally has an iTunes store to call their own. We get practically the same content as the US iTunes store and we have local artist thrown in the mix as well, and the prices are the same. For Malaysian Rm3.20 a song may seem like a lot, but that’s cheaper than an original CD and you don’t even need to buy all 12 songs. This is a Fantastic piece of news. By the way, last weekend, iTunes drop price of few albums to USD2.49. Example is Elton John greatest hit with 30 plus songs at USD2.49. Teresa Teng with same number of songs same price. Jacky Cheung 2 albums at USD2.49 each. I didn’t know iTunes randomly drop price without announcing to the world. Thanks for the update. I’m not really a Teresa Teng or Jacky Cheung , but an entire album for just USD2.49 (less than RM10), is probably cheaper than the even the pirated CDs. Just out of curiosity how many songs have you bought so far? I checked back with iTunes on my PC. It show 408 songs already. LOL. Wow, that’s about Rm1k you’d just use to buy legal songs. Malaysians aren’t cheap skates, we just have been denied the convenience of portals like iTunes , so we default to illegal downloads. Not really. Some of it is 99 cents per song. But most of the songs is from huge album selling for USD2.49. Example is 100 songs for USD6.99. Some album I bought is 32 songs for USD2.49. It was no where near RM1k. Probably just RM100~RM200. yahh i found out lot of albums in itunes msia are muchhhh CHEAPER than the USA.for example the cheapest in US is 7.99 usd for standard LP..and lots of songs in itunes msia are priced cheaper thn in the US. well it is due to malaysia lebels are less demading than USA label. u cant get a usd2 or 4 bucks album in USA itune..neverr..the US labels are hard on itunes. according to the website, Apple currently has affiliates in 19 countries, but not Malaysia or Singapore. Unfortunately, my gut tells me this will take a long time to reach Malaysia. Do you think it is necessary for Malaysians to buy from US itunes store vs Malaysian? In terms of gift cards, the Malaysians one doesn’t have it…can’t buy for others…what do u guys think?